With our wide variety of high quality abrasive, cutting, and grinding wheels, Wurth USA offers solutions to all of your maintenance and repair needs to keep your fleets operating efficiently and looking good! We also offer a wide selection of drill bits to fulfill your every repair need. 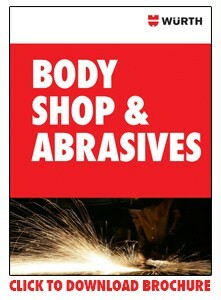 To see our complete line of Body Shop & Abrasive Products visit our online catalog. Wurth USA offers a full range of abrasive and cutting disks for all of your repair needs. Our customers can find the exact diameter and thickness their body shops need with Würth’s extensive assortment of grinding disks, surface conditioning disks, bristle disks, and cutting disks. Würth Surface Conditioning Discs provide a more compact structure of non-woven fibers than Buff & Blend products. Würth Surface Conditioning Discs have a woven fabric (scrim) embedded in the nylon structure to provide additional strength and durability for edge work, deburring and efficient blending of all metal types. The wide variety of Würth drill bits are designed to meet any repair need. Whether you want to drill through wood, metal, iron, or steel, we have your solutions.